Last Monday, the US State Department published the last batch of declassified emails from a private, unsecured server used by Democratic presidential candidate Hillary Clinton during her tenure as secretary of state. This latest release draws to a close a year-long review by US intelligence agencies of 52,000 pages of Clinton emails, ostensibly motivated by concerns over possible leaks of classified material. To date, more than 30,000 emails dating from Clinton’s four-year tenure as secretary of state have been released to the public. Clinton played a central role in the prosecution of aggressive wars in Afghanistan, Syria and Libya as well as the carrying out of drone assassinations and other illegal actions in a number of additional countries, including Pakistan, Yemen and Somalia. Yet in its extensive reporting of the email scandal, the American media has virtually ignored the actual content of these emails, which contain a wealth of information about the day-to-day functioning of the Clinton State Department. 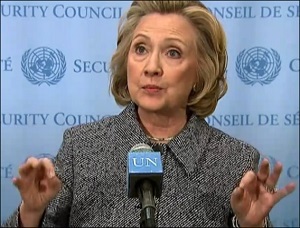 A review of even a small sampling of the emails, which are available on the State Department’s web site, reveals the reason why: the emails are a damning indictment of the criminal activities of not only Hillary Clinton herself, but the entire imperialist state apparatus, with the corporate-controlled media in tow. The emails could easily serve as evidence in future war crimes trials of Clinton and other top US officials. One particularly revealing email from 2010, cited by the Intercept web site but not picked up by the national media, recounts the experiences of former ambassador Joseph Wilson (whose CIA agent wife Valerie Plame was outed by the Bush administration in retaliation for his criticisms of the war in Iraq) during a recent trip to Iraq in his capacity as an executive for a US engineering firm. The Obama administration, elected by exploiting mass anti-war sentiment, continued the US occupation of Iraq for three years during Obama’s first term in office, when Clinton was secretary of state, prolonging a conflict that claimed more than 1 million lives. Since then, US troops have returned to Iraq, ostensibly to fight ISIS, as part of the US war for regime-change in neighboring Syria. Hundreds more emails deal with the US-led proxy war in Libya, in which Clinton played a leading role. As a recent series of articles in the New York Times confirmed, Clinton was the leading advocate in the White House for the clandestine arming of “rebel” militias comprised largely of Islamic fundamentalists, which comprised the main fighting force against the regime of Muammar Gaddafi. One email from February 2011, written by a veteran diplomat before the launching of the US-NATO war that ended with the murder of Gaddafi, lays out proposals for the construction of a future “post-Gaddafi” political order in Libya. The memo recommends the use of the United Nations to lend political legitimacy to the imperialist carve-up of the country. “A UN ‘hat’ for multinational/international assistance efforts could be effective,” the author states bluntly. However, the extensive involvement of Italy, whose participation in the war marked a return to the scene of its bloody colonial occupation, should, the author recommends, be “kept relatively low-profile.” Another email chain discusses how to disburse the tens of billions of dollars of frozen Libyan assets stolen by the imperialist powers during the regime-change operation. Many other emails concern the organization and coordination of the Obama administration’s drone assassination program, which has killed thousands in Afghanistan and Pakistan alone. “Twenty-two of the emails on Mrs. Clinton’s server have now been classified as ‘top secret’ at the demand of the CIA because they discuss the program to hunt and kill terrorist suspects using drone strikes, as well as other intelligence operations and sources,” the New York Times noted two weeks ago, prior to the latest release. “The emails [also] contain direct and indirect references to secret programs,” the newspaper added obliquely. One such secret program was the bribing of high-ranking officials in the Afghan government by the CIA. “[The US embassy in Afghanistan’s] line has been and will be the standard approach–that we refrain from comment on stories discussing intelligence matters,” one embassy official writes in a 2010 email, in response to an impending New York Times story revealing that Muhammad Zia Salehi, head of the Afghan National Security Council, was on the CIA payroll. Later reports by the Times revealed that former President Hamid Karzai for years received shopping bags full of cash from the CIA on a regular basis. Dozens of emails document the collusion between the corporate-controlled media and the State Department in containing the fallout from the release of US diplomatic cables by Wikileaks. In one 2010 exchange, Washington Postwriter Craig Whitlock reaches out to the State Department to request “a mechanism to receive [the] State [Department’s] input” before running a series of articles based on cables revealing the existence of a secret US drone base in the Seychelles Islands, off the coast of Somalia. Clinton also received hundreds of emails via her private server from Sidney Blumenthal, a former advisor in the Bill Clinton administration, who served as the head of Hillary’s 2008 presidential campaign. Blumenthal, then an employee of the Clinton Family Foundation, functioned as a de facto backchannel intelligence gatherer and advisor for Clinton, despite not officially being a member of her staff. It was Blumenthal’s 2015 testimony to the House Select Committee on Benghazi, the Republican-controlled body set up for the purpose of torpedoing the likely presidential run of Clinton, which revealed the existence of Clinton’s private email server. Blumenthal sent Clinton a wide array of intelligence reports from foreign countries targeted by US imperialism. In one email, he passes on concerns that Islamist militias in Libya might retaliate against the assassination of Osama bin Laden, using weapons obtained from the United States. In another, he recounts the furtive dealings between the Muslim Brotherhood and the Egyptian military to smother the Egyptian revolution, writing that the two will “continue to work together secretly in an effort to establish a stable government” and create “a secure environment throughout the country” for investment. In another email, Blumenthal advises Clinton on how to orchestrate the cover-up of the circumstances surrounding the assassination of bin Laden in a cross-border raid into Pakistan by US Special Forces. As a report by investigative journalist Seymour Hersh later made clear, the official version of bin Laden’s death was a collection of lies from start to finish. “Show [the pictures of bin Laden’s body] to members of Congress in a special secure room, something like when members were permitted to view Abu Ghraib pictures,” Blumenthal writes. What the ultimate outcome of the Clinton email scandal will be is not yet clear. An FBI criminal investigation into the emails is ongoing, with signs that the case might be headed to a grand jury. On Wednesday, a former employee of Clinton’s 2008 presidential campaign, Bryan Pagliano, who set up the private email server in Clinton’s home, was granted immunity by federal investigators as part of the investigation.